GOP House Rep Pulls Out Loaded Gun During Meeting - Joe.My.God. A South Carolina Republican congressman is not backing down from critics after he pulled out his own personal — and loaded — .38-caliber Smith & Wesson handgun during a meeting with constituents Friday. 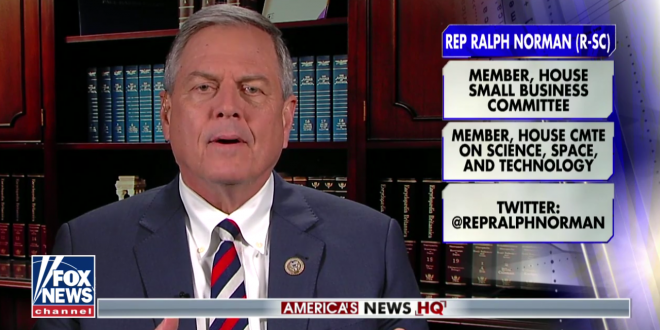 U.S. Rep. Ralph Norman, R-Rock Hill, told The Post and Courier he pulled out the weapon and placed it on a table for several minutes in attempt to make a point that guns are only dangerous in the hands of criminals. He was speaking to constituents about gun violence during a public meeting at the Rock Hill Diner. If anyone walked into the diner and started shooting, Norman told the attendees, he would be able to protect them because of his gun. Far from regretting the decision, Norman said he plans to do it more often at constituent meetings moving forward. He contested the notion that meeting attendees were scared at the sight of the gun, saying nobody jumped up or tried to leave the meeting.